On Saturday morning, we awoke to cloudy skies and rain. Luckily, we were leaving in a few hours for Turin. 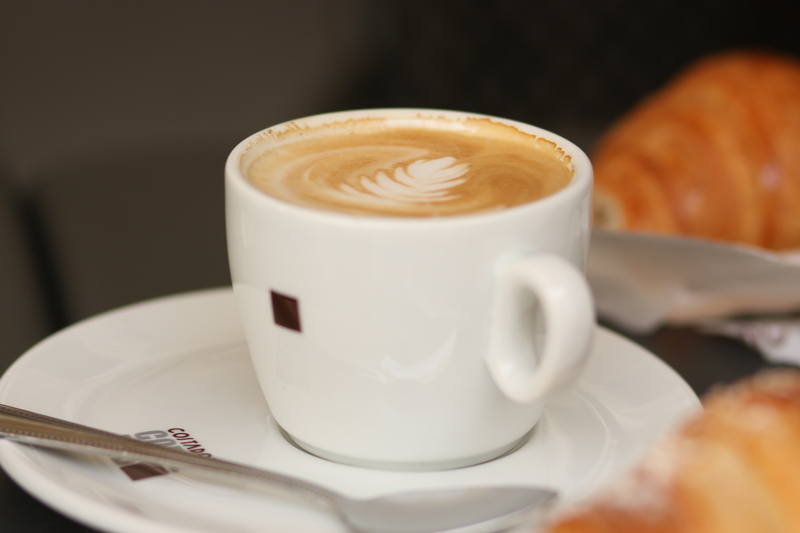 We grabbed a quick breakfast of cappuccinos and cornetti near the hotel at Caffè del Doge, a typically overpriced café. We actually made out better than expected–the list price for cappuccinos at the table (Italy charges more for sitting down for coffee vs. drinking it at the bar) was 7 euros, something we discovered after we’d ordered. That’s outrageous! In Pesaro, coffee “a tavola” is 2.50 tops. Anyway, we were freaking out about the price, but the cappuccinos turned out to only be 4 euros a piece, which isn’t that bad for Venice. Besides, the cafe was beautifully Venetian with baroque-style chairs with red velvet seat cushions, and our breakfast was served on silver trays, complete with glass pitchers of water and candies (torroncini, cioccolatini and espresso-flavored cookies) made especially for the café. So, we definitely paid for the atmosphere and non-traditional extras! Michael bought tickets for the traghetto back to Mestre (we couldn’t handle the crowded streets in the rain) and then we were off to Turin, making it in by 5 pm. However, we didn’t make it to the apartment until close to 6 pm because we got a bit lost. Having lived in the small town of Pesaro for 6 months (and being in the centro storico where no cars are allowed), I was unprepared for the traffic and hazardous driving by the locals! All lanes seemed to merge simultaneously with one another and no one stops–or brakes–for anyone; that’s not to say that the system doesn’t work. This is how Italians drive and, in my opinion, they’re more in tune with each other on the road than Americans are. Americans are sticklers for the rules and road rage is common–if you pass someone on the highway and accidentally cut them off, watch out. In Italy, this type of driving is par for the course, which makes the driving experience much more flexible. Anyway, we passed the central market, witnessing a fight between two men old enough to know better (I can’t even remember the last time I’ve seen an actual fist fight), and finally found the apartment on via Plana, near Piazza Vittorio Emmanuele. Another excellent, centrally located accommodation (thanks to Lorenzo Scardacchi!) with a great view of the hills. This was my first time in Turin and it’s surrounded by the gorgeous Alps and the French influence was obvious in the wide boulevards and leafy parks. The only problem was the pioppo (poplar) trees, which shed cotton-like snowflakes. I’ve never had allergies before, but this year has been one for the books. So, we freshened up and decided to take a walking tour to the Duomo. The next morning, we were visiting the Shroud of Turin (the Sindone), and we wanted to find the fastest route possible. Our tickets were for 7 am which turned out to be a blessing–as the first visit of the day, the lines were much, much shorter. 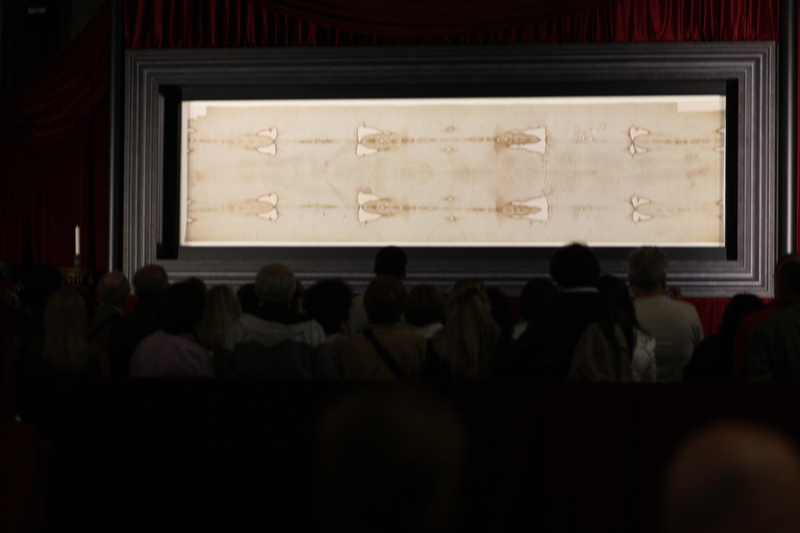 The Shroud hasn’t been open to the public for 10 years so Turin expects 2 million visitors in a period of six weeks. We left the apartment by 6:30 am and were in line right at 7 am, meeting our Barcelonian architect friend, Josep-Maria, who’s on a fellowship at the Università Politecnico di Turino for 6 months. Alex slept the entire time, right up until we were about to view the Shroud! Go figure. However, it was better than him crying while we waited in line for an hour because there was nowhere to sit and feed him. I didn’t get to view the Shroud as close as the other pilgrims did, but saw it from a distance of 20 feet. It was truly fascinating, and the Piemontese baroque-style of the Duomo, designed by the famous architect Guarino Guarini, was stunning. Josep-Maria said Guarini’s design has been used by subsequent architects to facilitate the viewing of relics at other pilgrimage sites. We were finished by 8:45 am and decided we needed some breakfast. We walked to a piazza near the Palazzo di Città and I had a delicious cappuccino and honey-flavored croissant, which tasted very flaky and French-like, probably because Turin is so close to France. As I expected, the coffee was much better than in Venice. 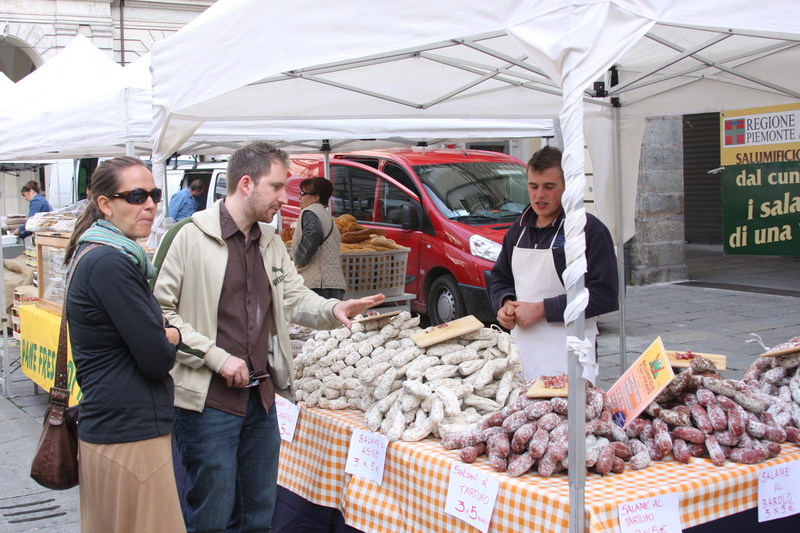 We sat outside, overlooking a bustling market, and Rob and Staci bought some fresh cheeses from the Alpine area outside of Turin (a Fontina and brie goat cheese), fresh bread and fresh meats (sausages flavored with truffles, rabbit and boar). The meat was so fresh it literally melted in your mouth. Later that afternoon, we checked out the Salone del Libro (Turin Book Fair). It’s difficult to buy books online in Italy (there’s no Amazon) and these book fairs are a good way for Italians to browse a huge quantity of books that no one bookstore can hold. The book fair was located in the old Fiat factory which had been converted into a mall/expo center. The factory was designed to accommodate an assembly line of cars that starts at the bottom and spirals up to the top, where the cars were then tested on a race track on the roof. The helipad for Fiat’s owners and the view of the Alps certainly adds to the glamor. That evening, we had an aperitivo in Piazza Vittorio Emmanuele. This is a ritual that has not caught on in the States, but I wish it would. We paid 7 euros for a before-dinner drink and an all-you-can eat buffet of snacks. Piling our plate high with cheeses, mini omelets, olives and arancini balls, we enjoyed the view of the Madre di Dio church over the Po River on one side and the iconic Mole Antonelliana on the other. A perfect way to end the day, and to end our trip. The next morning Rob and Staci left for a week in Paris and Michael gave a lecture at the Università Politecnico di Turino. Then, back to Pesaro, and back to reality. At least, as real as an expat life in Italy can be! This entry was posted in Italy, road trip, travel, Turin and tagged books, cafe, cappuccinos, coffee, croissants, food, Italy, markets, pilgrimage, road trip, tourism, tourists, travel, Turin. Bookmark the permalink.